I’m all about Cyber Monday and the shopping I can do from my couch – hate the crowds. Thankfully there are so many great deals, there’s really no reason to brave the holiday crowds unless you want to. Use coupon code CYBER20 to receive $20 off $75 and free shipping at Walgreens.com November 28th-December 4th. Wait until Monday to use the coupon. CYBER15 is also good for $15 off $60 with free shipping and CYBER5 for $5 off $30+ with free shipping. Use coupon code GETMP3S to receive a $3 credit on all Amazon MP3 purchases, expires at 11:59 pm pt November 29th. Coupon code 55WIDE will get you 55% off your entire order at e.l.f Cosmetics all day Cyber Monday. I love e.l.f and wear their eyeshadow and booster daily! Guys: this is a great stocking stuffer gift idea for Mom! 20% off and free shipping at Scholastic Books with coupon code SSBF20, expires end of day November 29. 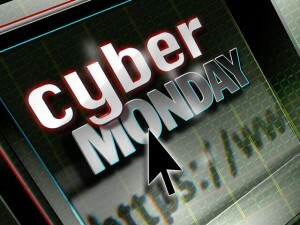 Know of a good Cyber Monday deal or coupon code? Comment below and I’ll enter it in this post or add it as a new post. CONTACTFR gives you free shipping at Kohl’s…the really great thing is that both codes can be used and there’s no minimum amount. I just used them on a $12 purchase.